Continually evolving and advancing aviation occupant safety requirements need the most advanced restraint systems to meet compliance. In the event of an otherwise survivable accident, AmSafe's Structural Airbag System protects passengers of all sizes from traumatic head and neck injury. The airbags are stored in the forward monument or seatback, making the airbag invisible to the passenger. First certified and flying in 2012, sophisticated, patented “active-positioning” airbag designs deploy the airbag safely away from the occupant, before placing the airbag in front of the strike hazard in milliseconds. AmSafe structural airbags are safe for all size passengers, passengers in the brace position, lap held children and children in child seats. The EMA is comprised of the system electronics, crash sensors and an advanced, non-rechargeable lithium battery. The EMA can control up to 3 inflators or 3 pretensioners. The sensor and electronics detects and analyzes decelerations. The airbag or pretensioner will not deploy inadvertently during normal operations such as a hard landing, random vibration or food cart strikes on the seat. Deployment will occur, however, when a force is at or above 6gs for approximately 50 milliseconds. 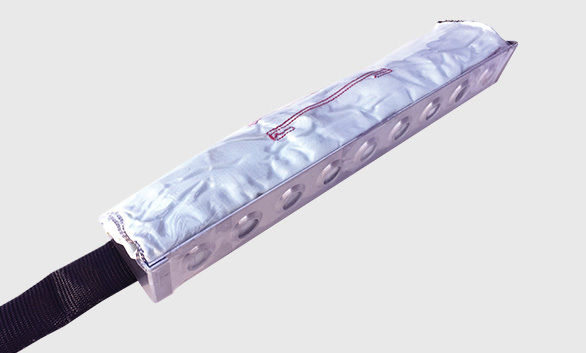 The airbag inflator consists of a compressed gas cylinder optimized for the aviation environment and the airbag size. The inflator has a life limit of 10 years. The cable interface assembly connects the EMA to one, two or three inflators or pretensioners. AmSafe airbag and pretensioner system diagnostics need to be performed at 4,000 flight hours for commercial aircraft applications. All NexGen diagnostics are performed by pushing the test button on the EMA or by using AmSafe wireless software to check the entire cabin at one time without accessing the EMAs. The V23 EMA uses a specialized hand-held diagnostic tool to check the system status. Trained technicians can easily perform the test. AmSafe offers specialized maintenance training for aircraft OEMs, operators and service centers. Airbag integrated into the seatback or forward structure – invisible to passengers. A standard two-point restraint secures the passengers. Patented “active-positioning” airbag design ensures the system is safe for all size passengers with no operator restrictions.